The chancel and most of the nave are late C12 and show that this was already a large church by that date. C14 alterations included a tower, work on the chancel, a lengthened nave and wider aisles. C14 screens and other fittings remain. Though a church existed by 1054, when the advowson was granted to the Norman abbey of Fécamp (6 p1), nothing visible predates the later C12. The church is large and, except for the west end, had reached its present dimensions by 1200. The late C12 work has been linked to the transfer of the advowson to the Treasurer of Chichester cathedral (5 p18) and may have been started by William de Neville who held the office from 1170 to 1185. The chancel is lower than the nave, because of a fall in the ground and was built first. Its three-bay arcades have pointed heads, their outer orders decorated with a variant of chevrons. On each side are a round and an octagonal pier and the stylised foliage of the capitals is close to crockets. The arcades extend to the east end, showing the chancel was never lengthened, unusually in the case of chancels of this period. It is inclined to the south, but this is not obvious, as its aisles, rebuilt later, are straight. The chancel arch, now distorted, resembles the arcade, with chevrons and crenellations on the west side and a form of lobes to the east. Despite its round head, the more fully developed stiff-leaf capitals of the semi-octagonal responds show it is later than the arcades. 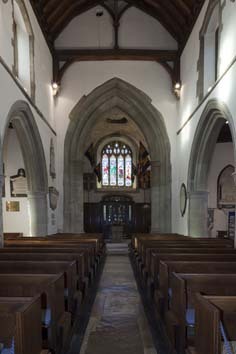 The first four bays of the nave, like the chancel, have alternating round and octagonal piers and the stiff-leaf capitals follow on from the chancel arch. All heads are pointed with two orders of hollow and filleted mouldings. The late C12 walls stand to their full height, with clerestory lancets that have shafts and foliage capitals. The deep interior splays are linked by a roll-moulding and the exterior is largely faced with flint and stone chequerwork. The detail is reliably restored, showing the nave was finished by 1200. There was little certain C13 work thereafter. The moulded south doorway with head-stops, which dates from early in the century, might suggest a remodelling of the aisles then, but as the present aisle in which it is reset is C14, the extent of this cannot be guessed. Though now in the centre of the aisle, before the nave was lengthened it was closer to the west end. 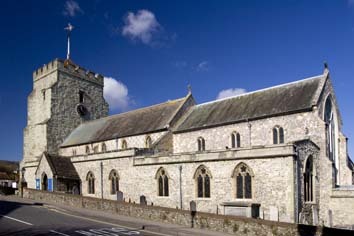 The church, already big, was enlarged and altered in the earlier C14. Work probably started with the chancel, for though the present east window is C19 and its predecessor was C18, the opening is C14. The chancel aisles were widened with three-light east windows, the south one with geometrical tracery and the other with curvilinear. The irregular cusped shape in the heads of the north aisle windows is likely also to be original. All the rere-arches have shafts, but the octagonal ones to the north may be slightly later. Though restored, the windows are as on the Sharpe Collection drawing (c1804). Later alterations have made the C14 rebuilding of the nave and aisles hard to follow. 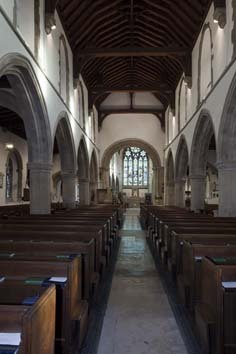 The aisles are higher than those of the chancel and wider than their predecessors, particularly to the south. The encircled cinquefoils in the heads of the windows east of the south porch are an earlier motif than the north windows, which are as in the north chancel aisle. However, all the rere-arches have similar polygonal capitals, so the difference in date is not great. Porches were added each side; the south one was rebuilt in 1868, but the C14 north one has a moulded arch and square recesses of uncertain purpose each side. A modern covered way leads from this porch to the restored old parsonage, originally C16. In the aisles were chapels, screened from one another, for six guilds or brotherhoods (7 p107). 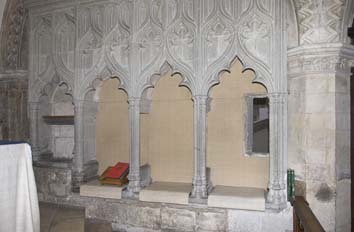 Such screens survive in the chancel and arches by both doorways mark their position in the aisles. The double-chamfered arch in the north aisle is complete, whilst the south one is a moulded half-arch with a grotesque corbel, emerging on the inner side from a piece of walling extending almost halfway across the aisle. On the north side, the rood-stair turret, with a conical top, spans the join between nave and chancel; its lower entrance with a segmental head is visible inside. The screen lasted until 1844 (2 p125). Surviving traces of the roodloft on both arcades and the chancel arch show it was large, with a second stair in the south respond of the chancel arch. In consequence, the arch from the south aisle into the chancel aisle is narrower than the one to the north. When the aisles were rebuilt, a further bay and tower were added at the west end. It is odd that so large a church had not had a tower previously, unless it was on the site of the new bay, which seems unlikely in view of the large amount of work that would have been necessary to remove and replace it. The additional arcade-arches either side are intended to match the others, but the mouldings of the heads are thin and the attempt at stiff-leaf capitals is clumsy. The contrast is evident in the capitals of the new piers; half of each is adapted from the late C12 west responds. 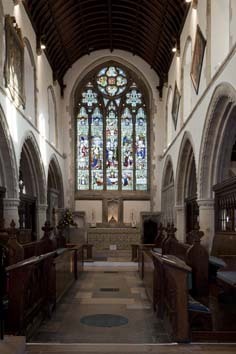 Outside, the work uses mostly local greensand with two-light square-headed clerestory windows and two south west aisle windows have panelled tracery. The aisles have single roofs over all their length and despite restoration old ties and crownposts remain. 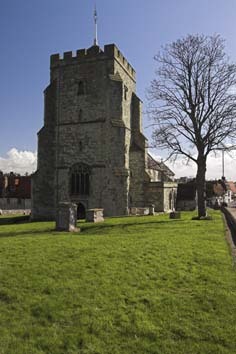 The tower is also largely greensand, badly weathered, with heavy diagonal buttresses, a west doorway with a square hoodmould and a four-light window. All are much restored, but the panelled tracery is late C14 in form, as are the single bell-openings with square hoods, battlements and cap. Inside, the space has a barrel-vault and unlike the extended arcades, the tower arch is unquestionably of its period, with big semi-circular responds and three hollow-chamfered orders. The vestry or sacristy across the east end has a doorway and four-light window with depressed heads, the latter in a shallow gable. 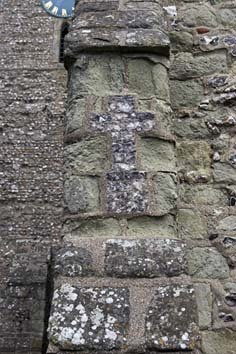 The form of these points to the later C15, though the window has been renewed. The sacristy is thus probably little earlier than the clerestory windows of the chancel, which have four-centred heads and Y-tracery that look early C16. Dates of some changes between the C17 and the early C19 are known. One roof timber of the south aisle, dated 1623, was found in 1868 (2 p186) and by the late C18 the curious east window shown by Adelaide Tracy (1855) (IV p45), with plain intersecting tracery of wood, had replaced the C14 original. In 1792 and 1818 galleries were inserted in both aisles (ibid p273). Finally, the chancel roof was repaired in 1826 (4 p129). This work on the chancel roof preceded by two years the advent of Thomas Pitman as vicar; he remained until 1890 and to him is due the present appearance of the church. The concept of restoration was barely known in his first years and only in 1843 did Pitman start work with the chancel. He cleaned the screens and repaired other fittings. A report in The Ecclesiologist for December 1852 (pp440-41) implies the east window had not yet been replaced, but although Adelaide Tracy shows it in 1855, she may have copied an earlier engraving in her possession. Expenditure of £93 0s 4 1/2d in 1853-54 (Parliamentary Paper XLVIII p184 – my thanks to Martin Jones for this reference) may be connected with this. By 1855 Pitman had approached the ICBS, mainly over the reseating of the nave, for which plans were made in 1851 by R C Carpenter. Carpenter appears to have done more work on the chancel and may have been involved as early as 1843. He is known to have designed some fittings (see below) and the present east window is also ascribed to him. After his death E Christian did further work on the chancel in 1858 (4 p129) and restored the nave in 1868-70 (B 25 p477). He rebuilt the roofs, re-using old timbers, and the south porch. Despite the criticism of The Ecclesiologist in 1852, the galleries had lasted until then. The chancel aisles were taken in hand in 1871 (2 p198). Most work was complete by 1873, though there was more in 1878 (Harrison p59) and in 1891, when £700 were spent (KD 1899). Since then the only major changes have been to the glass. Much was destroyed in World War II, including six roundels of C17 Flemish glass (SAC 88 (1949) p161 (footnote)). 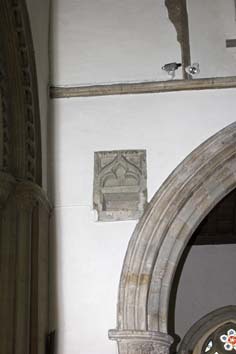 Aumbry: (East wall of chancel) C14 with a slight ogee-head, connected with the reredos (see below) and corresponding to the vestry doorway to the south. Churchyard cross: Said to have been brought here in 1817 from St Erth, Cornwall and made of granite. It has a Maltese cross on the head and the shaft is carved with interlace and geometrical patterns, which are in places badly weathered. No date is offered by www.crsbi.ac.uk (retrieved 1/4/2013), but it is on balance unlikely to be later than the C12. Easter sepulchre: (East arch of the north chancel arcade) Free-standing with a cusped ogee-head under a flat top and C14. It was renewed after the Lushington memorial (see below) was moved. Font: C14 of greensand and thus local. 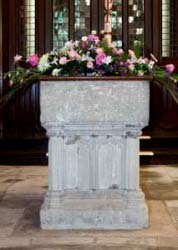 Its square bowl has a thick panelled stem (cf St Mary, Willingdon etc). 2. (South aisle) Four windows to members of the Brodie family by Clayton and Bell, 1860s (ibid). 3. (North aisle, fifth window) Clayton and Bell, 1872 (ibid). 4. (South chapel, first south window) Heaton, Butler and Bayne, 1897 (www.stainedglassrecords.org retrieved on 11/2/2013). 6. (South chapel, second south window) Clayton and Bell, 1925 (WSRO Fac 1974). 7. (East window) C E Moore, 1929 (DSGW 1939). 8. (North chapel) R O Bell, 1937 (signed). 9. 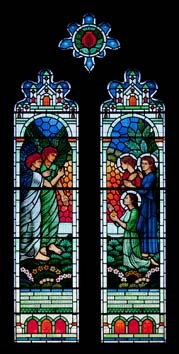 (North chapel, first window) Two lights by A E Buss (left) and H Easton (right) (1953). They come from the demolished church of St George (www.stainedglassrecords.org retrieved 11/2/2013). 10. (South chapel east window) D Strachan, 1949-50, giving thanks for the preservation of the church in World War II (A C Russell p45). 11. 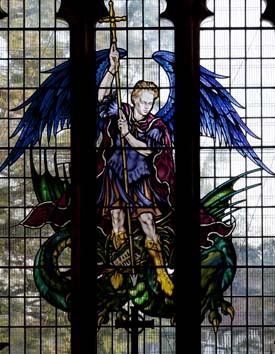 (North chapel east window) H Easton, St George and the dragon, 1953 (DSGW 1958). 12. (North chapel) M Lawrence, 2003 (DSGW 2003). This is in what might be termed a simplified pre-Raphaelite idiom. Graffiti: (On the arcades of nave and chancel). There are numerous fish on the latter, no doubt recalling the prosperity that fishing brought to the community (for more detail see 1). The rest are mostly geometrical. 1. (North chapel) Katherine Gildridge (d1625 or 1629) and two infants. Inscription in an architectural surround by E Marshall (Roscoe p809); it is his earliest dated monument. Her husband’s family was long established in Eastbourne and Willingdon (Visitation of 1530 etc p146) and gives its names to one of the main streets of the town. 2. (South aisle) Henry Lushington (d1763), attributed to Sir R Taylor (BE(E) ibid), contained in a gothick recess. The workmanship is of some skill with a bust with a turning head and artfully swirling drapery. The son of the then vicar, he survived the Black Hole of Calcutta but died in India. Originally the monument was in the Easter sepulchre, which was largely destroyed when it was installed. It was moved to the north chancel aisle in 1851 and again, by L W Ridge, in 1908 (2 p273). Llewellyn (p110) suggests that changes were introduced during the various moves; this is likely, though they probably do not include the recess as he suggests. 3. (North aisle) Mary Lushington (1775?) by J Morris (Roscoe p854). 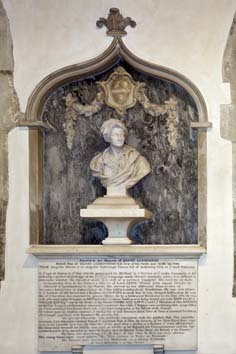 The nearby monument to Mary Ann Willard (d1812, but dated by Llewellyn to the 1770s (p112)) is very similar and he attributes it to Morris also. 4. (North aisle) Jane-Eliza Wake (d1823) signed ‘Whiting, Northampton’, who is presumably J Whiting (Llewellyn p122). 5. John Willard (d1845) by Patent Marble Works (ibid p954). 6. William Rason (d1859) by J S Westmacott (ibid p1352). 1. (High above the south east nave respond) C14 ogee-headed with a shelf. It shows the position of the altar in the rood-loft. 2. (Next to sedilia on south side of sanctuary) C14 and closely related. Like the sedilia (see below), it has a flat top above panelling which is in turn above a cusped head. There is also a shelf. 3. 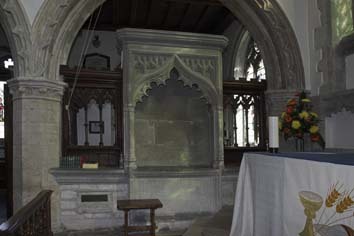 (South chapel) C14 with a trefoiled head. Niches: (East responds of nave arcades) C14 with a cinquefoiled head to the north and a larger ogee-headed one to the south. Pulpit and reading desk: The former of stone, both by R C Carpenter, 1851 (2 p196). 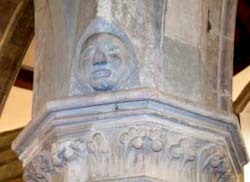 Recess: (South chancel aisle) Low moulded segmental head with curling stops and thus C14, probably for a tomb. Reredos: The east wall of the chancel, with an ogee-headed doorway and an aumbry, marks the C14 reredos, which may have been related to the screens (6 p4) (see below). 1. Painted panel in a frame with a curving, broken pediment; George III. This must be the arms known to have been painted for the church by J Lambert junior of Lewes (Brent: Georgian Lewes p120). 2. Painted panel in a carved rectangular oak frame. Elizabeth II, 2012. Screens: (In the two western bays of the chancel and across the east ends of both chancel aisles). They have castellated tops and are divided by shafts into narrow lights with traceried heads. The tracery includes ogees and they are C14. The whole group gives a good impression of an enclosed mediaeval chancel. Sedilia: (Eastern arch of the south chancel arcade) They fill the arch and are part of the C14 fittings, being closely related to the Easter sepulchre opposite and to the adjacent piscina with which it is linked (see above). All three have flat tops and each of the three seats has an ogee-head. Stalls and pews: R C Carpenter, 1851 (2 p196). Stoup: (By south doorway) Plain and pointed, probably C14.